Salome receives the Head of John the Baptist; Bernardino LUINI; c. 1527; oil on canvas; Musée du Louvre, Paris. Salome is a pretty girl; her face is serene and calm. 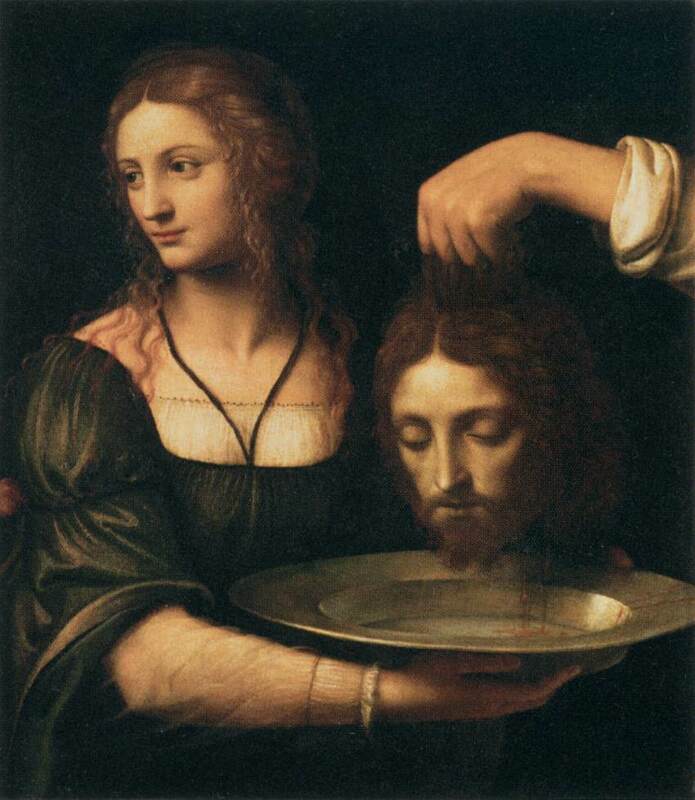 She has just been given the head of John the Baptist on a tray or platter, that is to say without her doing anything. Be attentive to the image above: the arm that can be seen is not Salome’s but that of the man who places the head on the tray. Salome, the girl’s name, does not appear in the Gospel but is given by the Jewish historian Flavius Joseph. She is the daughter of the first marriage of Herodias and Philip, King Herod’s brother; she is then at the same time the king’s niece and his daughter-in-law. John the Baptist has been beheaded at Salome’s demand but at the advice of her mother Herodias after she has charmed King Herod with her dance. So Salome brings the tray to her mother and she can hold the head by the hair to present it to her. The scene is seldom gory for the dead man’s face also expresses serenity, that of the just man. 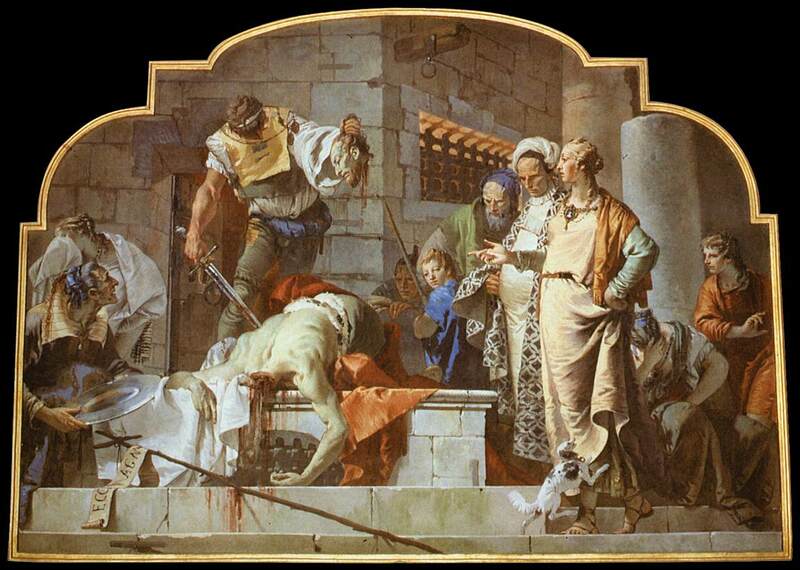 The execution or “decollation” of John Baptist is the centre of the narrative. The executioner beheads him with a sword or an axe right on the ground, in a more or less realistic manner. Then he seizes the head and places it on a platter that he hands out to Salome who is attending the scene. The banquet is sometimes represented in the background. King Herod celebrates his birthday with his new wife Herodias and the members of his court. He wears a crown or a Jewish cap, his clothing and the scenery are more or less sumptuous. They are waiting for John the Baptist’s death. Salome’s dance is sometimes integrated into the scene or treated separately, the movement is suggested by the veils whose number, fixed by the legend, is seven. Salome brings the platter with John’s head into the banqueting hall. 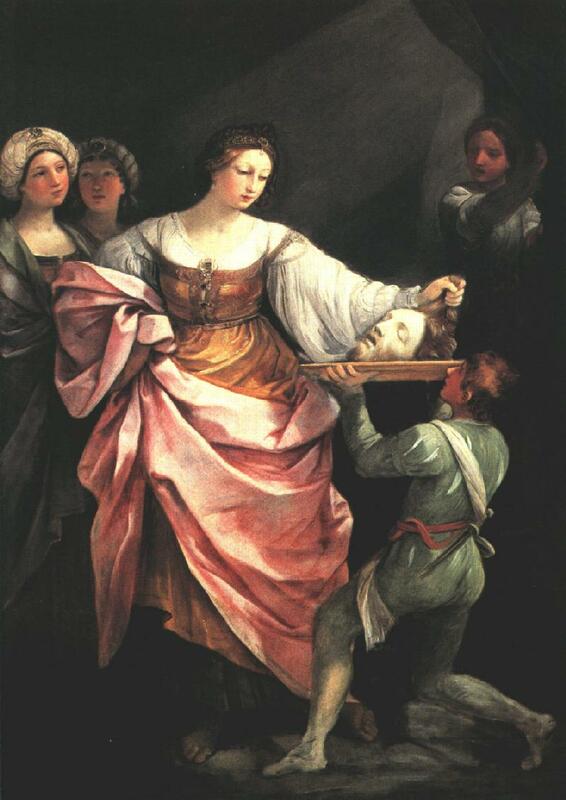 This scene is to be compared to the one where Judith holds Holofernes’ head (See Judith). Herod and Herodias cover their eyes in disgust or Herodias, more depraved, pierces John’s tongue with a needle to manifest her hatred for his words. The head of John the Baptist can also be represented by itself on a tray. It is a common motif, the emblem of brotherhoods of mercy. Jael kills Sisera by driving a Stake into his Temple; illustrator of “Speculum humanae”, Cologne; c. 1450; manuscript MMW 10 B 34; Museum Meermanno Westreenianum, The Hague. is a murder which could easily be confused with that of Judith. The Book of Judges (Chapters 4 and 5) tells the story of Deborah who succeeds in vanquishing a Cananean chief named Sisera. The latter takes refuge at Jael’s house but when he is asleep she kills him by driving a stake into his temple with a hammer. The woman’s attitude is similar but the weapons are quite different and this horrible murder is seldom represented. The Gospel according to Mark, chapter 6. John the Baptist is a prophet asking for the conversion of sinners. In Galilee, he denounces the local king, Herod Antipas, who has married his sister-in-law Herodias. For John has said to Herod: It is not lawful for you to have your brother's wife. the daughter of the said Herodias came in, and danced, and pleased Herod and those who sat with him, the king said to the damsel, Ask of me whatsoever you want, and I will give it to you. And brought his head on a platter, and gave it to the damsel: and the damsel gave it to her mother. John the Baptist’s death is that of a prophet, the one whose words disturb the established powers. John the Baptist being the “forerunner” of Jesus, his death also heralds that of Christ. A representation of the preparation of the execution. The Beheading of St John the Baptist; MASACCIO; 1426; tempera on panel, Gemäldegalerie, Berlin. John the Baptist as a martyr. The image of humiliated innocence. The representation is to be compared to that of Christ tortured. 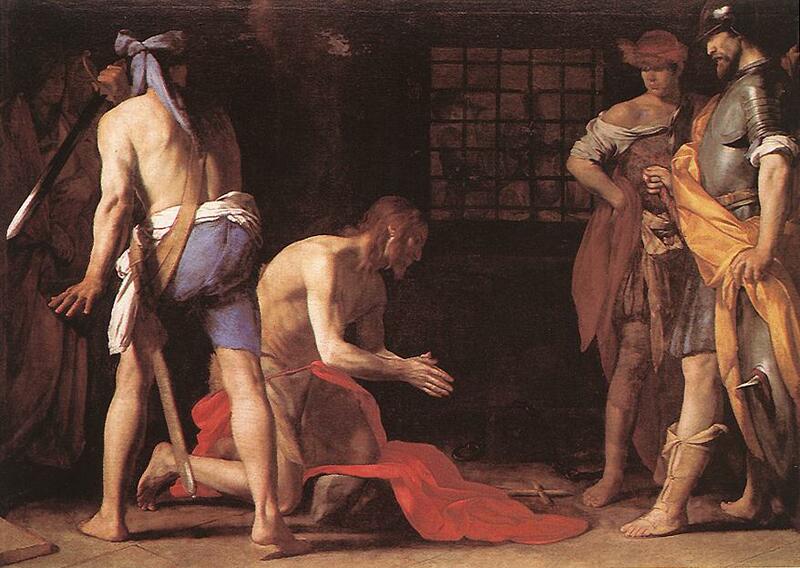 The Decollation of John the Baptist; Massimo STANZIONE; 1634; oil on canvas; Museo del Prado, Madrid. The classical period shows some taste for the macabre. And in Caravaggio, Salome is not a mere spectator. The Beheading of St John the Baptist; CARAVAGGIO; 1608; oil on canvas; St John Museum, Valletta, Malta. The opposition between the executor and the girl; which one of the two is the real executioner? Salome receiving the Head of John the Baptist; Matthias STOM; before 1640; oil on canvas, National Gallery, London. 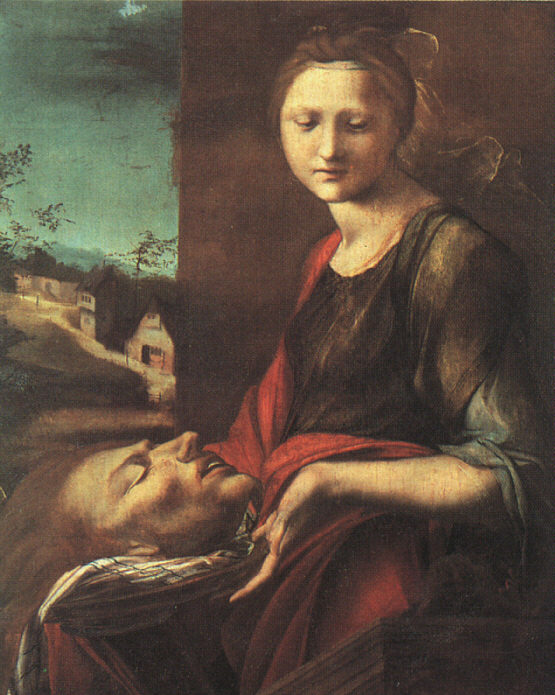 Salome’s face is marked with deep gentleness, which contrasts with Judith’s fierce determination. Salome; TITIAN; c. 1515; oil on canvas; Galleria Doria Pamphili, Rome. The nearness of the two heroines: Klimt who had painted several Judith's has deliberately added Salome’s name on it. Cranach has built his two paintings in the same register. Judith I (Salome); Gustav KLIMT; 1905; oil on canvas; Österrisches Museum, Vienna, Austria. On the left = Salome; Lucas CRANACH; c. 1530 oil on wood; Museum of Fine Arts, Budapest. 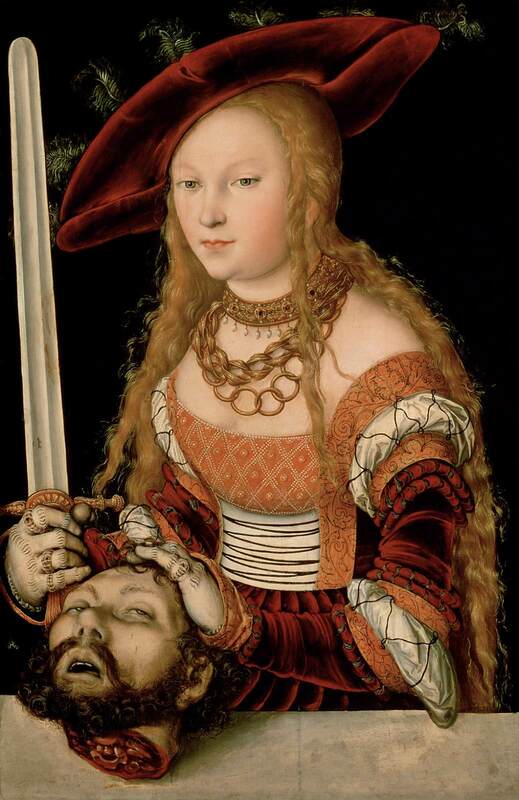 On the right = Judith with the Head of Holofernes; Lucas CRANACH the Elder; c. 1530; oil on canvas; Kunsthistorisches Museum, Vienna, Austria. John the Baptist is the cursed prophet and the greatest saint. It has been said about him that he “preached in the desert”, that is to say for nothing. But he is the forerunner, the one who proclaims and recognises the Messiah, the one who is present with Mary in the scenes of the Last Judgement (See the Last Judgment). Whereas all the saints, whether martyrs or not, are celebrated on the day of their death, John the Baptist is the only one whose feast day corresponds to his supposed birthday. This feast, on June 24th, sometimes called “Summer Christmas” has been for centuries the occasion of festivities around “St John’s bonfire”. This tradition continued an old pagan feast of light on the day of the summer solstice (Midsummer’s Day). An 8th century Latin hymn in honour of John the Baptist that is at the origin of the name given to the notes of the musical scale. The notes bore the names of the letters of the alphabet from A to G (this practice is still used in England and in a great number of countries) but, in the 10th century, Guido d' Arezzo found it difficult to sing with them. He then took a hymn dedicated to St John the first syllable of each line of which corresponded to the following note in the scale. Thus he had the note C = Ut sung, then D = Re and so on. In the 17th century as the name “ut” was not judged very harmonious, the musician Jean-Baptiste DOni replaced it with the first syllable of his name “do”. In the 1959 stage musical The Sound of Music, the tune of "Do-Re-Mi" is used by Maria to teach the notes of the musical scale to the Von Trapp children. who saw in her the symbol of the young immoral beauty, of the femme fatale, and even that of the vampire woman.